Shaders are small programs that execute on the GPU, and loading them can take some time. Each individual GPU program typically does not take much time to load, but shaders often have a lot of “variants” internally. Large numbers of these shader variants increase game build time, and game data size. Loading large numbers of shader variants during game is slow and takes up memory. Individual shader features, for shaders that use #pragma shader_feature. If none of the used materials use a particular variant, then it is not included into the build. See internal shader variants documentation. Out of built-in shaders, the Standard shader uses this. Shader variants to handle Fog and Lightmapping modes not used by any of the scenes are not included into the game data. See Graphics Settings if you want to override this behavior. Combination of the above often substantially cuts down on shader data size. For example, a fully compiled Standard shader would take several hundred megabytes, but in typical projects it often ends up taking just a couple megabytes (and is often compressed further by the application packaging process). Under all default settings, Unity loads the shaderlab Shader object into memory, but does not create the internal shader variants until they are actually needed. This means that shader variants that are included into the game build can still potentially be used, but there’s no memory or load time cost paid until they are needed. For example, shaders always include a variant to handle point lights with shadows, but if you never end up using a point light with shadows in your game, then there’s no point in loading this particular variant. One downside of this default behavior, however, is a possible hiccup for when some shader variant is needed for the first time - since a new GPU program code has to be loaded into the graphics driver. 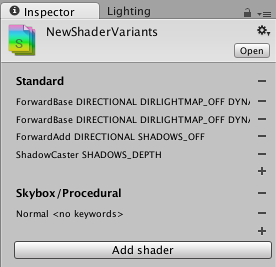 This is often undesirable during gameplay, so Unity has ShaderVariantCollection assets to help solve that. ShaderVariantCollection is an asset that is basically a list of Shaders, and for each of them, a list of Pass types and shader keyword combinations to load. To help with creating these assets based on actually used shaders and their variants, the editor can track which shaders and their variants are actually used. In Graphics Settings, there is a button to create a new ShaderVariantCollection out of currently tracked shaders, or to clear the currently tracked shader list. Once you have some ShaderVariantCollection assets, you can set for these variants to be automatically preloaded while loading the game (under Preloaded Shaders list in Graphics Settings), or you can preload an individual shader variant collection from a script. See ShaderVariantCollection scripting class.